Minimize waste of water, by using the automatic faucet. Immediately reduces water waste by eliminating unnecessary and unattended water flow. Fits all standard US plumbing.Uses 4AA Alkaline Batteries (purchase separately).Water Pressure: 0.5 - 7.0 KGS/cm, 10-125 psi. Our Capacitive Sensor Faucet: Windowless capacity sensing, angle free activation.The sensor field is 360 degrees around the body of the faucet.Self-adjusting to its installation environment.Suitable for commericial bathroom and public places. I've been thinking about having sensor faucets installed in the comfort rooms, and now that budget will finally allow it, I decided to go for this one. It doesn't look fancy and all, but it does look contemporary and sleek. But of course, the sensors. Well, they're great and I haven't had any problems with them whatsoever. 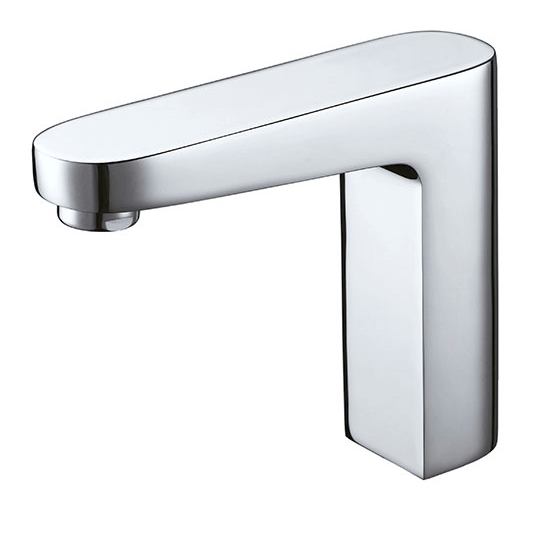 This is probably one of the best sensor faucets here in the site, especially when you consider the price (and we were able to buy it on sale which makes the deal even sweeter). I placed an order for these and had them installed weeks ago. So far, they're all working wonderfully, and I haven't seen any issue with them. I checked back to Bath Select to look for some shower heads, and saw this in the home page. I actually bought ten of these a few months, five each for the male and female bathrooms, so this review comes a bit late. But then, since I was impressed with the item, I decided to leave a comment - and that would be: FANTASTIC. The sensors worked pretty well - they still do until now - and never had any trouble with them to date. The water saving feature is true, with the automatic shut-off working great. I have nothing negative to say about this product, and highly recommend it to restaurant owners out there like me. Last June I had bought 4 of the Velagio motion sensor faucet overall very impressed with the quality and finish. Works well and installation was a breeze, no complaint whatsoever.